This past week I made the annual discovery that never ceases to excite me: the first of the prune plums are in! 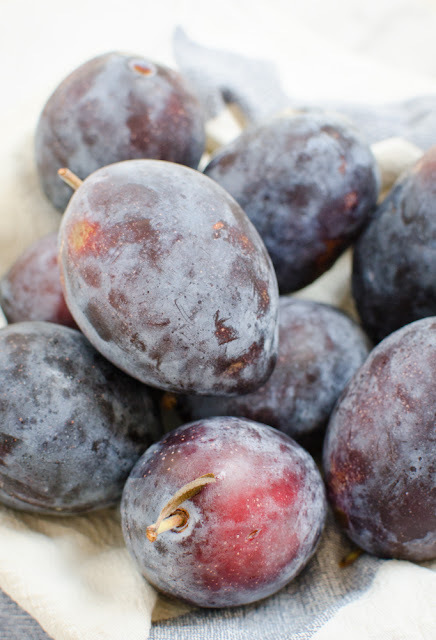 Always available only briefly sometime around late August or September, these plums are a hallmark of the season. 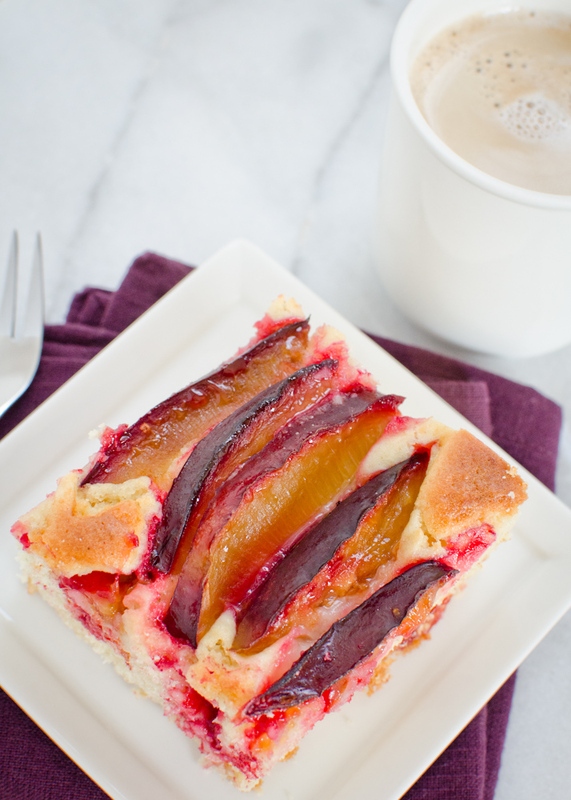 I love the pleasant tart flavor, how easily the fruit separates from the stone, and the gorgeous red color they yield upon baking. 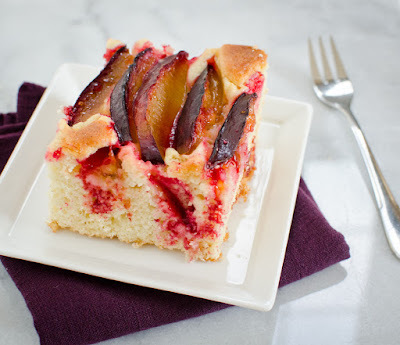 And beyond baking, I think they're also my favorite plums to eat in hand, as they aren't very watery and thus can be eaten relatively daintily and respectably--no worry of juices running all over the place! At first glance, I thought these were Italian prune plums, but then their enormous size had me questioning. Turns out they are actually a variety called "President Plums," but other than their size, they are essentially like my beloved Zwetschgen. Traditionally, I go straight to my family's German recipe for Zwetschgenkuchen, but this year I decided to change it up a bit with a simpler cake. This one is not too sweet and is great on its own, or you can add a dollop of yogurt for breakfast, or dress it up with whipped cream for dessert. Cream together the butter and sugar, then beat in the eggs one at a time, followed by the vanilla extract. Beat until light and fluffy. In a separate bowl, combine the flour, baking powder, salt, and cardamom. Add half of the flour mixture and all of the milk to the creamed mixture and gently incorporate. Then add the remaining flour mixture and gently mix until just combined. 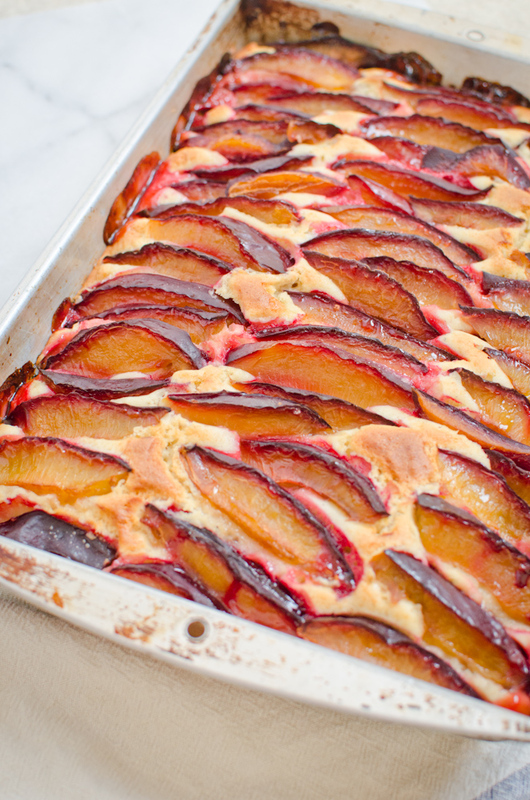 Spread dough in a lightly-greased 9x13-inch pan and arrange the plum slices over the top. Bake at 350 for about 35-40 minutes or until a toothpick inserted into the center comes out clean. Let cool slightly before cutting. Schwarzwälder Kirschtorte - A Birthday Cake! We recently celebrated a very special family day, my father's birthday! With my parents, my sister and her two little kids, and my brother all in town (first time us siblings have been together in over a year and a half! ), we had a great day. 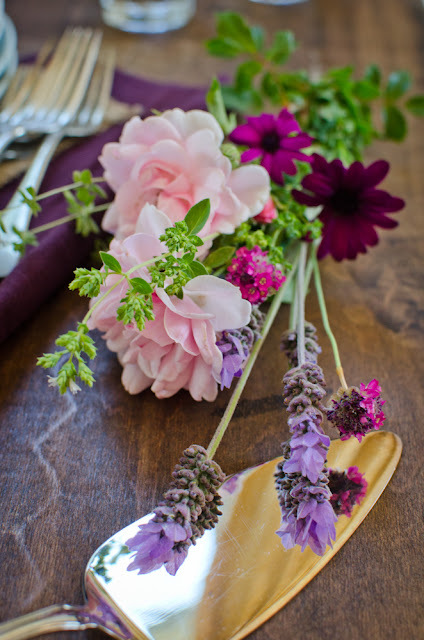 There's nothing like being together with the important people in your life that makes a celebration special. As always, my present to the birthday child is to bake them a cake of their choice. 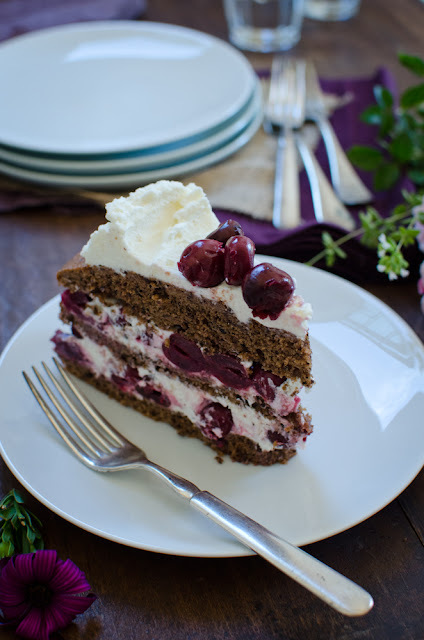 This year, my father--a transplant to the California coast from Germany--requested a Schwarzwälder Kirschtorte, that is, in English, "Black Forest Cherry Cake." 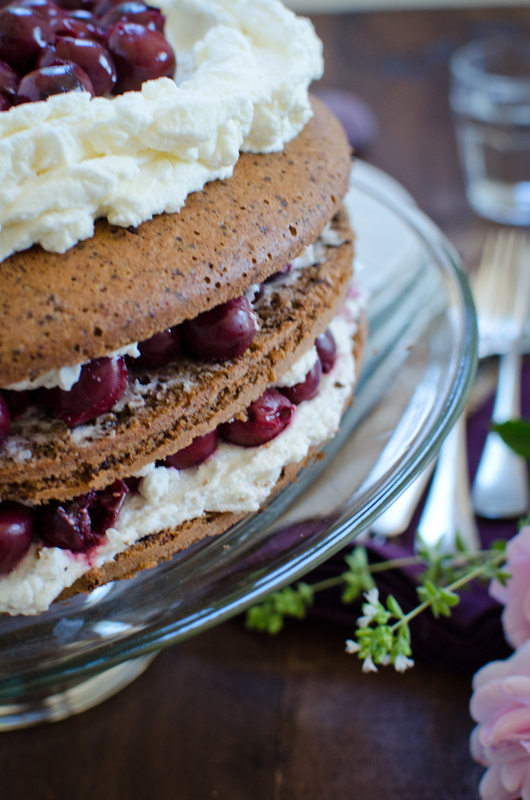 It's a towering, intimidating creation, usually with at least three layers of chocolate-flavored cake, juicy sour cherries, and more fluffy fresh whipped cream than you would ever imagine. The last time I made one was way back in the time of Ancient History, and as I searched for photo inspiration online this time around, I was excited by the potential of something great. Yet at the same time, I shuddered at how easy it would be to fail in the assembly, ending up with a sloppy pile of whipped cream garnished with messy swaths of chocolate shavings and cherries so unnaturally bright red that I suspected they might be radioactive. So, while I chose a seriously legit recipe (taken from a well-loved and well-used copy of the Bayerisches Kochbuch) and the flavors are all there, I decided to keep the finish minimal, going for a more natural and rustic look. I love how it turned out, and importantly, so did my father! Delicately chocolatey and with a pleasing nutty fragrance, the cake layers are enriched with the addition of grated semisweet chocolate and ground almonds. Then there are the juicy cherries and spikes of kirschwasser, keeping the cake tender and giving fun bursts of flavor. 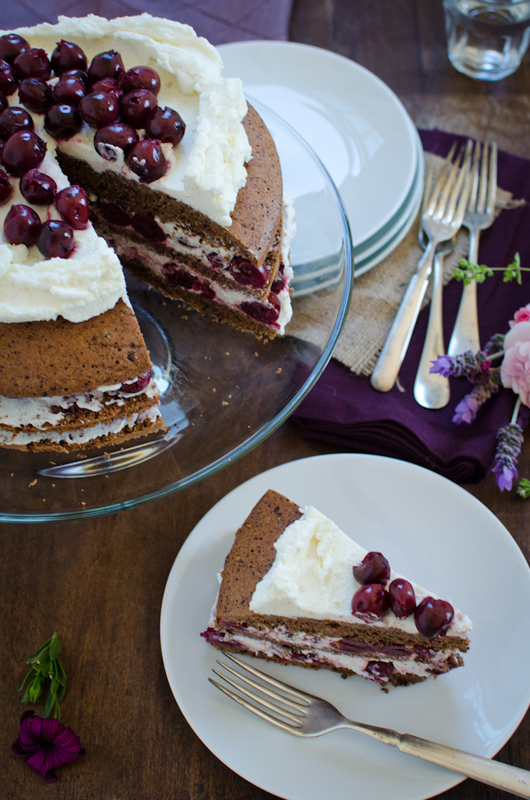 And the whipped cream, also enhanced with kirschwasser, marries the layers and flavors of the torte in the exquisite way only possible of the German Sahnetorten. Yes, there is a lot of whipped cream, but then, with all the family in town, we've got lots of help to polish it off! Though the recipe is certainly a labor of love (I've added some of my personal tips to help avoid trouble spots along the way), the staggering cake is a wonderful treat--definitely worth it for someone as special as my father. We enjoyed it together for a late-afternoon birthday Kaffeetrinken, and I hope you have a chance to enjoy it sometime soon too! Prepare a 24 - 26 cm (9.5 - 10.5 inch) springform pan by lining the base with parchment paper, then lightly greasing and dusting the base and sides with flour. Set aside. In the bowl of a large stand mixer fitted with the whisk attachment, whip the butter until light and fluffy. Slowly add the sugar and beat until well incorporated and fluffy. Add the egg yolks, 2 at a time and beating well in between each addition, scraping the bottom of the bowl as needed; then add the vanilla extract. Beat well until the creamed mixture is very light and fluffy. Remove the whisk attachment from the stand mixer and fit with the paddle attachment. In a separate bowl, stir together the grated chocolate and almond meal, then add to the creamed mixture in 3 separate additions, gently beating to incorporate evenly, and scraping the sides of the bowl with a spatula as needed. At this point, set the oven to preheat at 170-180 C (340-350 F). In a separate bowl (can use the same bowl previously used for the chocolate and almonds), sift together the flour, baking powder, and salt; set aside. In another bowl, beat the egg whites with a pinch of salt until stiff peaks form, using an electric hand mixer. Add the flour to the batter in 3 separate additions, gently beating with the paddle attachment to incorporate evenly, and scraping the sides of the bowl with a spatula as needed. Remove the bowl from the stand mixer, and, using a spatula, gently fold in the stiff egg whites in 3 separate additions. Immediately transfer the batter to the prepared springform pan and bake for 40-60 minutes, depending on the size of the pan, until toothpick inserted comes out clean of batter (there may be some melted chocolate on the toothpick). After baking, let the cake cool in the pan for about 5 minutes, then remove from the pan and invert onto a cooling rack, removing the parchment paper from the bottom of the cake. Let cool completely. If making the day before, wrap well in plastic wrap and store at room temperature overnight. The night before assembly, drain the cherries well of all juice (reserving the juice for another use) and set them to chill in the refrigerator. The day of, set a large metal bowl and the whisk attachments of an electric beater to chill in the freezer. The whipping cream may be measured out and chilled in the freezer too, to get it extra cold. Split the cake into 3 layers. (Toothpicks around the perimeter as cutting guides, and a noose of sewing thread, are my tricks to getting even layers with a minimum of crumbs!) Place the bottom layer on your cake plate. Mix 6 tablespoons of the reserved cherry juice with 2 tablespoons kirschwasser and set aside. Whip the cream until very soft peaks just start forming, then whip in the softened gelatin and beat thoroughly. Just before stiff peaks form, add the sugar and the kirschwasser and continue beating until stiff peaks form. Brush or spoon 1/2 of the cherry juice-kirschwasser onto the base layer, then spread about 1/6 of the whipped cream over (a thin metal spatula works well for this job). Completely cover the base with a single layer of drained, chilled cherries tightly-spaced, then spread another 1/6 of the whipped cream over. Place the 2nd cake layer on top and repeat with the cherry juice-kirschwasser, whipped cream, cherries, and whipped cream. Add the last cake layer, then top with the remaining whipped cream, swirling decoratively and creating a slight depression at the center with a fluffy rim. Arrange the remaining drained cherries over the center of the whipped cream. 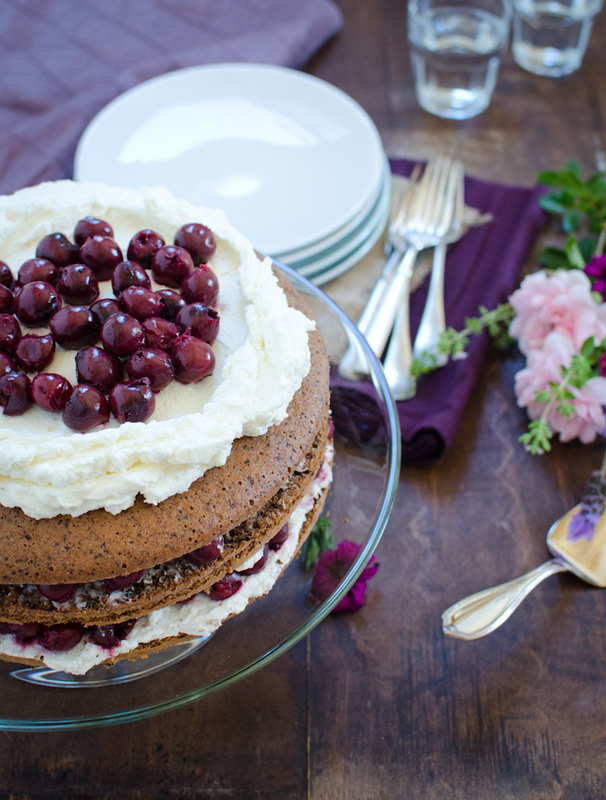 Chill the cake in the refrigerator for at least 1 hour before serving, to let the whipped cream set and to let the flavors of the layers meld. I've had so much fun getting back into cooking! Not only do I have my familiar kitchen tools around me again, but I also have appreciative family members around me that make the effort worth it. 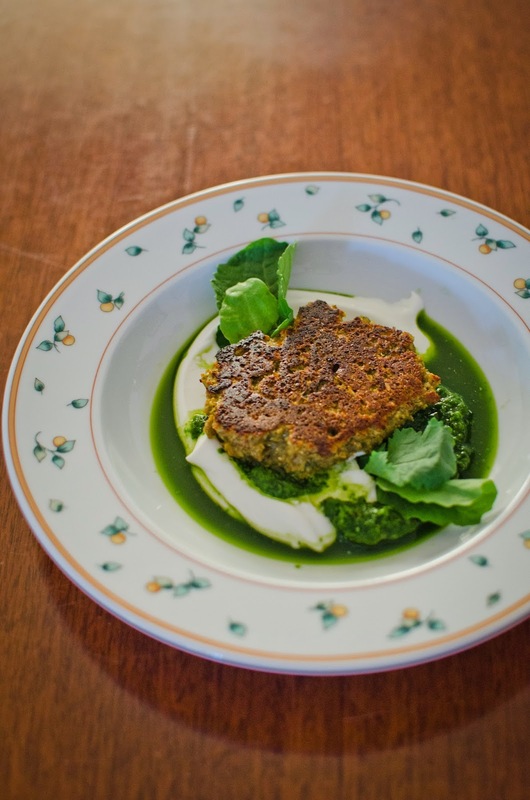 Last night, I experimented with this recipe from San Francisco's Bar Tartine for Lentil Croquettes with Watercress and Kefir, published in Bon Appetit's April 2015 issue. Uncertain of how it would go over with my parents, I hedged and presented it as a first course before the actual dinner. But it actually turned out to be such a hit that we ended up making it the main part of our meal! 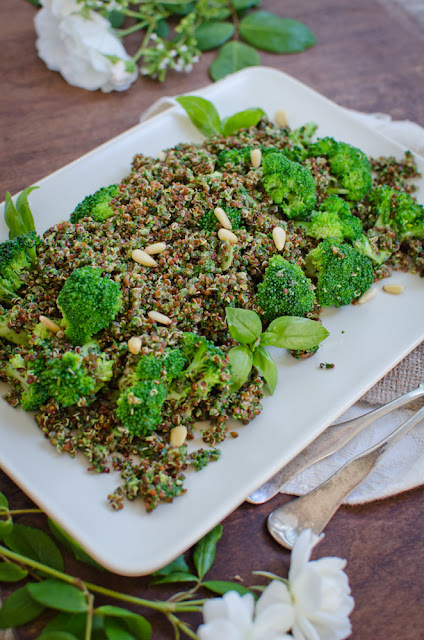 At first glance, the original recipe sounded not only delicious and healthy, but also absolutely intriguing, with a medley of fascinating ingredients combined in ways I hadn't thought of before. The problem was, however, that the ingredient list and prep steps seemed just a tad too extensive to make this immediately accessible for the home cook. Though I have many types of whole seeds on hand, I just didn't have whole caraway seeds. Then there were items that I've never cooked with. Onion powder? Nope. Pomegranate molasses? No again. Watercress? Couldn't find it in my local stores. I also don't happen to have a spice mill, and I never feel like shallow-frying is worth the inevitable clean-up of oil spatters afterwards. So, I made a bunch of substitutions in both ingredients and method, and I discovered this is a pretty forgiving recipe. One thing I did indulge in was to make the sprouted lentils at home. You can find sprouted lentils in many produce stores and farmers' markets these days, but actually it is quite easy to do at home. I sprouted 3/4 cup dry lentils in a 1-quart mason jar, ending up with about 3 cups of sprouted lentils after 2 days. First, wash your lentils and remove any debris. Then cover your lentils with about 3x volume of water and let sit 12 hours. Drain and wash lentils (a fine-mesh sieve held against the mouth of the jar helps to keep the lentils in the jar), cover loosely (cheese cloth or mesh works well--anything to allow breathing but to keep dust out is great), and let sit at room temperature out of direct sunlight for about 2 days, washing and draining well every 12 hours. 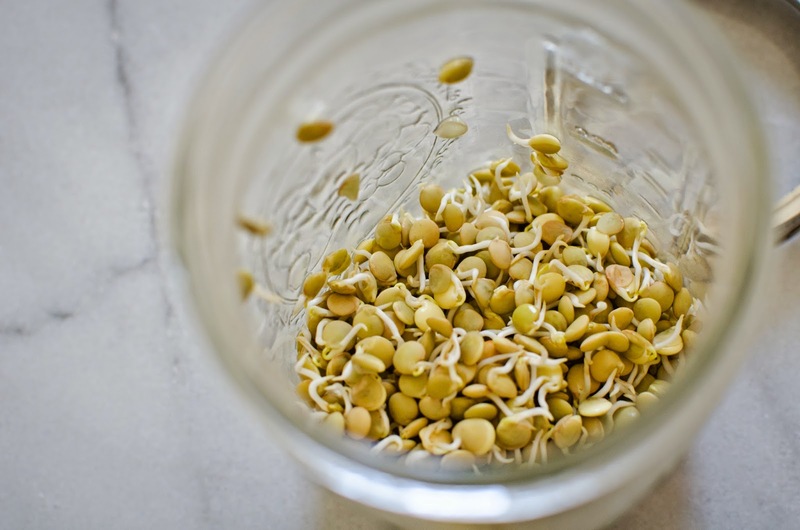 When sprouts are of desired length, store lentils in the refrigerator and use within a few days. 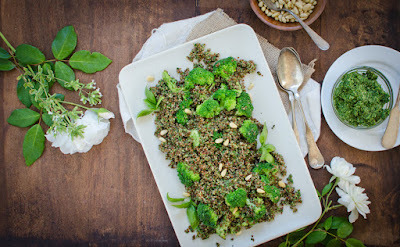 Besides this recipe, sprouted lentils are fantastic in salads or just as a snack as-is! 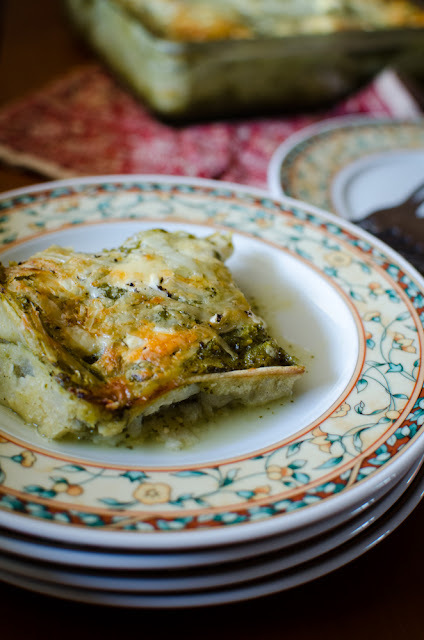 This dish is such a tasty and fun combination of flavors, colors, and textures, that I am keeping the recipe to make again. Yogurt Sauce: Stir yogurt and agave syrup with a little water to loosen; set aside. Lentil Burgers: Heat a large non-stick pan over medium-high heat; add cut scallions and cook until blistered and charred, turning occasionally. Reserve pan. 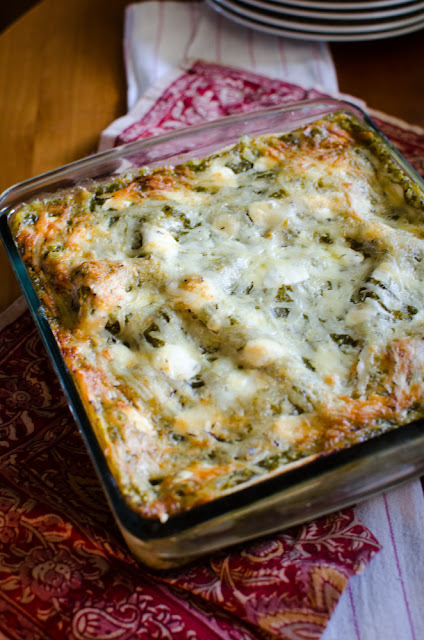 Heat the non-stick pan over medium-high heat once more and lightly brush with olive oil. When pan is sizzling (a drop of water dances), portion out the sprouted lentil mixture as desired, smoothing to form patties. (I divided my batch into 6 patties, cooking 3 at a time in the pan.) Cook until edges begin to show a toasty golden brown, then flip, cooking the second side. Patties may be served warm, but they are delicious at room temperature as well. To serve: Plate swirls of the yogurt and green sauces in shallow bowls. Top with sprouted lentil patty and garnish with greens. Kimchi. Some people are wild fans, whereas others...let's say they just don't realize it, but one day they will love it! It has a deep and pungent flavor and is often (but not always) spicy, qualities that make it so addictive. 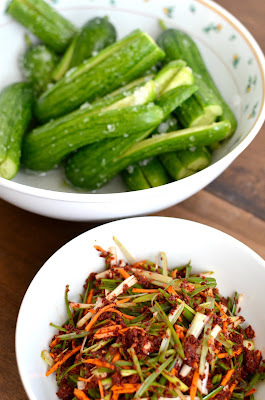 Chances are, most Americans have tried the traditional Napa cabbage kimchi if they've had kimchi at all before, but there is an endless number of delicious varieties like daikon kimchis, radish-tops kimchis, green onion kimchis, and the cucumber kimchis I'm showing you here. 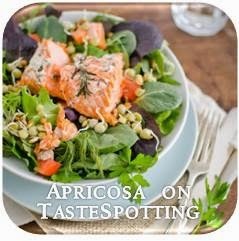 And like any country's beloved dish, the recipes for each of these styles vary from region to region and household to household. This version, in which small cucumbers are stuffed with Korean red pepper and vegetables, is called oisobagi (오이 소박이). Flavorful and refreshing, it goes well with simple soups and porridges, or as one of many side dishes in a larger meal setting. Start by cutting and salting the cucumbers, and as the water is drawn from them, prepare the delicious stuffing of carrots, green onions, and Korean red pepper flakes (gochugaru). Traditional oisobagi uses a combination of green onions and buchu (a Korean herb like chives but much more delicately flavored), but lacking buchu, substitute with more green onions. 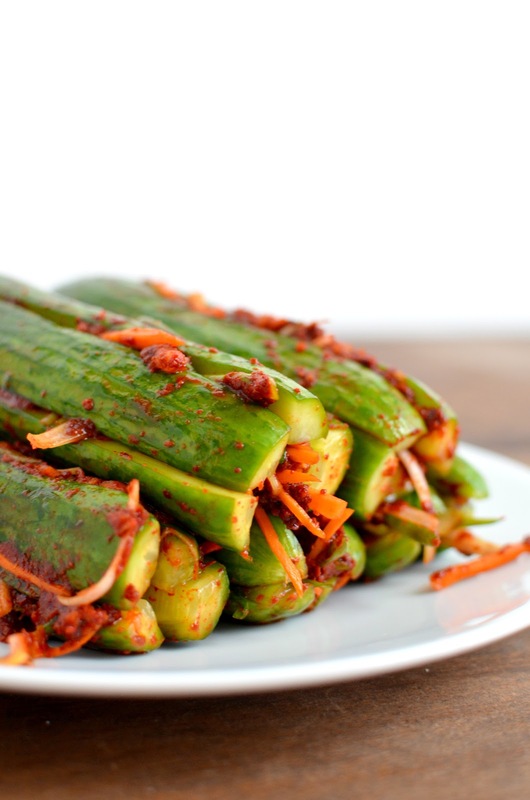 There are so many ways to enjoy kimchi. Korean style, it could be served in combination with any of your favorite Korean side dishes, or (especially with the cabbage variety) chopped up and incorporated into fried rice, as a part of a stew (great use for more aged kimchi! ), or simply over a bowl of steamed white rice. Or try incorporating it into Western dishes. These oisobagi, for example, when chopped, would be a great new topping to try out on hotdogs or hamburgers--think a spicy cross of pickle and sauerkraut! Wash cucumbers and cut cross-wise slits down the length of the cucumbers, leaving sections attached at one end of the cucumber. Rub all surfaces of the cut cucumbers with salt and let drain 30 minutes. Thoroughly rinse off salt from the cucumbers under running water and drain cucumbers well, patting dry. Mix together the fish sauce, gochugaru, garlic, ginger, and sugar to form a paste, then stir in the carrots and green onions. 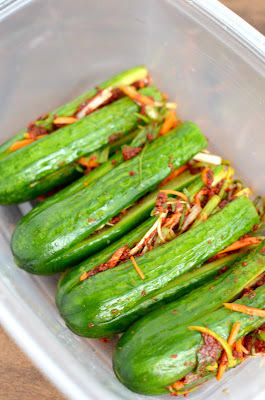 Working with gloved hands (to avoid staining them with the pepper paste), stuff each cucumber with some of the filling. 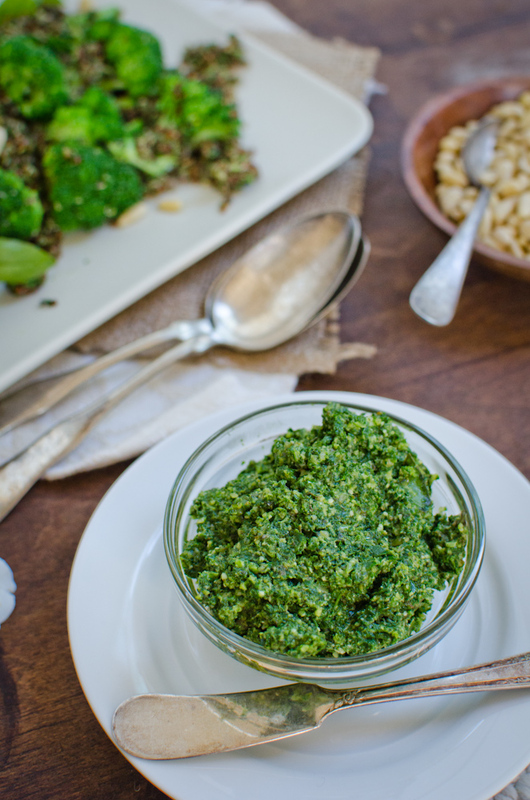 Enjoy right away or store away in an airtight container, refrigerated, for later use. 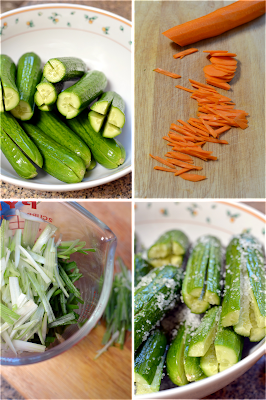 When serving, you might want to cut each cucumbers cross-wise once or twice with kitchen scissors to make smaller pieces. As I ease back into life in Santa Barbara, I'm inspired daily--by the natural beauty of this place, the beckoning hiking trails, the sunshine, and the fresh air--to get out and be active and seek out healthier eating habits. 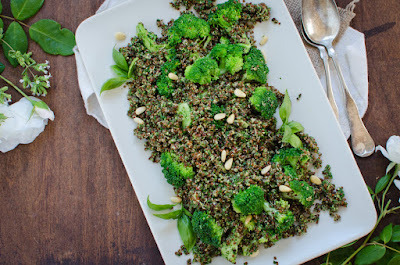 And as springtime warms up, I'm definitely craving flavorful and fresh food that satisfies but requires minimal effort. 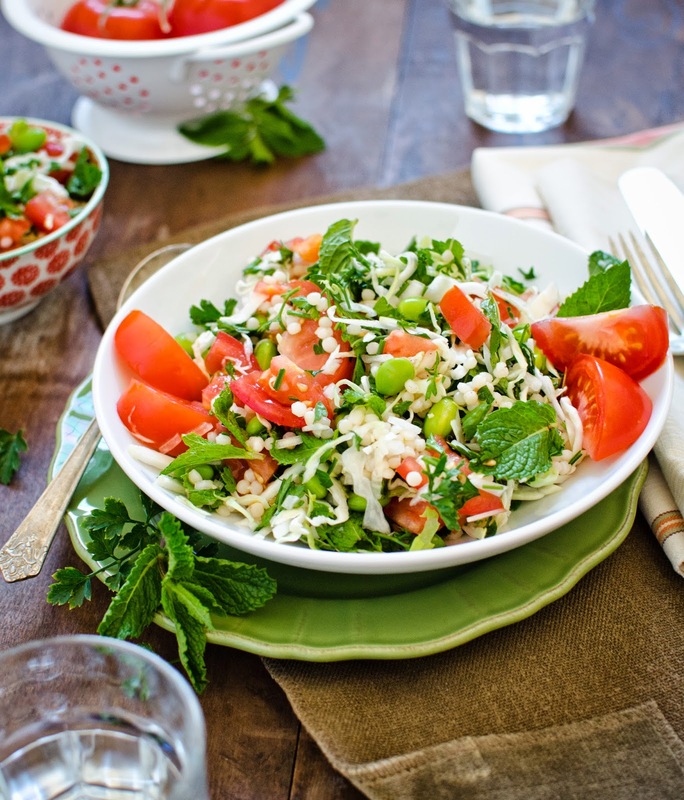 This tabbouleh fits right in. 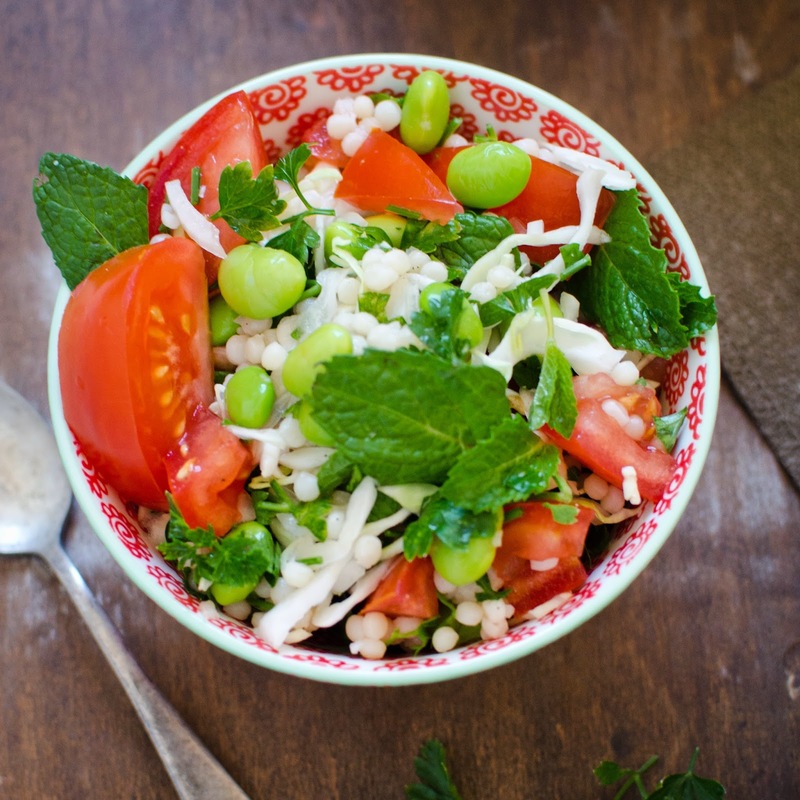 Using chewy pearls of Israeli couscous instead of the traditional bulgur, it's a delight for the tastebuds and a breeze to make. You'll love eating this as a refreshing side dish to juicy grilled steaks, sausages, chicken, or fish, or simply as a vegetarian main dish all on its own. 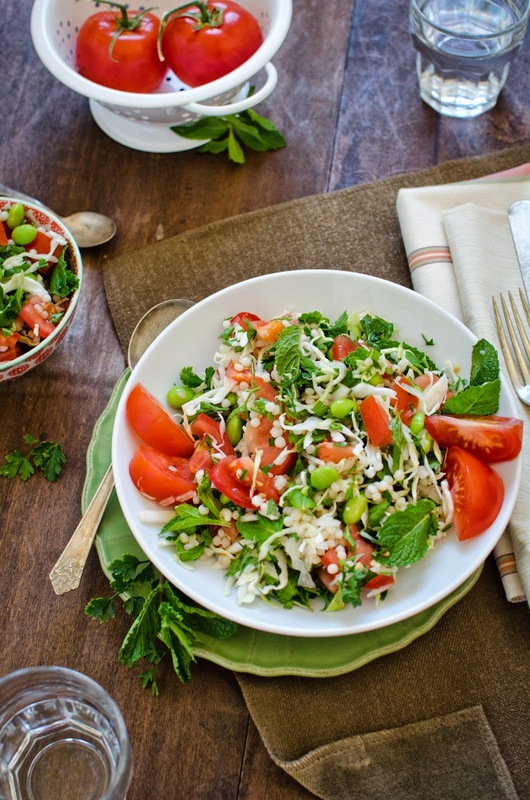 Based mostly on veggies and protein-rich legumes, this salad is oh-so-good for you. And it's a great dish to make ahead! Munching on leftovers the next day, the flavors had melded, and it was so delicious to tuck in spoonful after spoonful. Hope you enjoy it as much as I did! Cook the couscous according to package directions, then let cool to room temperature. Once cooled, gently combine the couscous with the cabbage, herbs, edamame, onion, and tomato (along with any tomato juice released during dicing). Season to taste with salt and pepper and a few dashes of lemon juice and olive oil. Serve at room temperature. Can be made 1 day ahead; gently stir to redistribute any collected juices before serving.